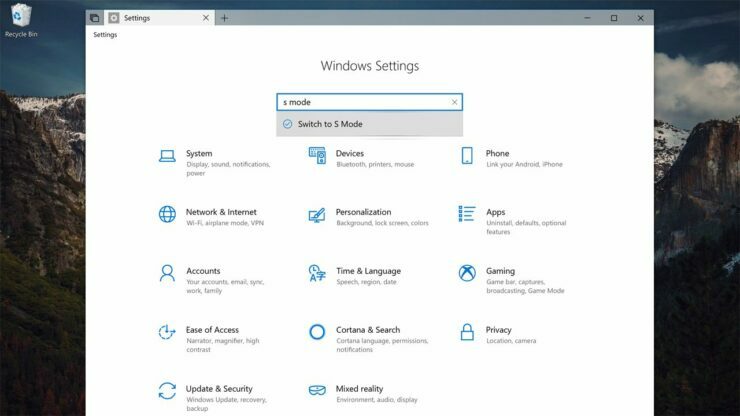 Windows 10 RS5 Preview Hints Users Will Be Able to "Switch to S Mode"
Windows 10 S Mode is the locked down version of the operating system that is a reincarnation of Windows 10 S designed to compete against the growing market of Chrome OS. When Microsoft released Windows 10 S, users were given an option to upgrade to Windows 10 Pro. However, the company later announced turning this separate edition of Windows 10 to a “mode” that offers businesses and educational institutes offer a browser-based version of the full-grown operating system. Microsoft had said that the new “Windows 10 S mode” will replace the existing Windows 10 S SKU and will be offered as the locked-down version of Windows 10 Home, Pro and Enterprise. Currently, with the Windows 10 April 2018 update, users can switch out of the S Mode, however, they can’t go back to the S Mode. It isn’t clear how this switch will work, but it has appeared in the latest Preview’s Settings app, as reported by Thurrot. If true, this means that switching out of S Mode won’t be a one way street as users will also be able to go back to the S Mode. This system does sound confusing, though. Windows 10 S Mode essentially locks you out of everything but the Store. If you can go back and forth and download non-Store programs, would you be able to use them while in the S Mode? Will they get removed when you make the switch? We will know more when – and if – Microsoft delivers this option with the next Windows 10 update expected in October. But, it does look convenient if the company can figure out how admins can offer S Mode to some users while still having access to the complete version of the OS.